Security Council resolution 1907 (2009) specifically prohibited Eritrea from “harbouring, financing, facilitating, supporting, organizing, training, or inciting individuals or groups to perpetrate acts of violence or terrorist acts against other States or their citizens in the region”. 78. Ginbot Sebat is a banned opposition group formed in 2009 by Amhara political elites committed to regime change in Ethiopia through armed struggle. [i] The Monitoring Group has previously documented Eritrea’s support to Ginbot Sebat (see S/2011/433 and S/2012/545). In 2012, the Group received corroborating testimonials that three Ginbot Sebat fighters had been trained in the western military border zone under the direction of Colonel Fitsum. At the time, the Monitoring Group was unable to reach a conclusion as to the former fighters’ organizational affiliation or to verify their accounts of military training, but it did conclude that they had direct contact with Colonel Fitsum [Yishak]. 80. The first fighter was captured in January 2014, while on a reconnaissance mission inside Ethiopia. 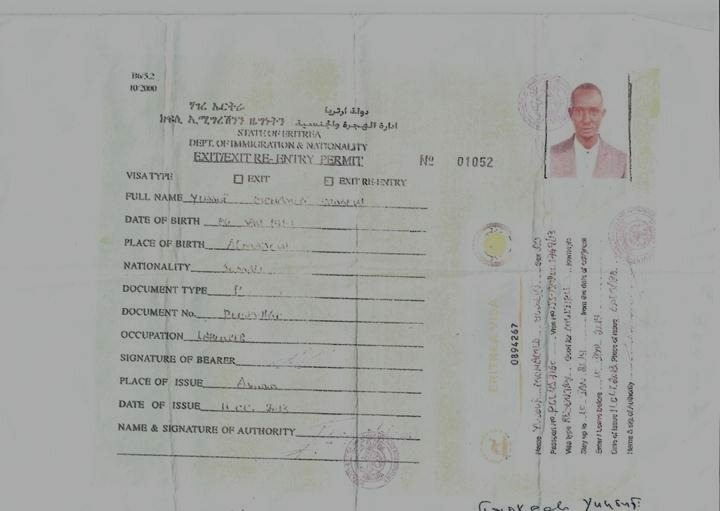 During a meeting with the Monitoring Group on 3 February 2014, while he was in detention in Ethiopia, he said that he had been a supporter of Ginbot Sebat and that he had been recruited into their military wing while working as a day labourer in neighbouring Sudan. Eritrean soldiers picked him up and took him to Eritrea, where he was subsequently sent to a training camp in Harena (see annex 7.1 for a map with the location of Harena). There, he joined 28 others and they were taught how to operate machine guns, bombs, and hand grenades. He identified a captain in EDF(Eritrea Defence Force) by the name of Dawitt as the person in charge of running the training and day-to-day operations for Ginbot Sebat. In December 2013, the detainee said that Dawitt had instructed him and two other Ginbot Sebat members to travel to Ethiopia to identify strategic locations and routes for the future movement of weapons. Areas identified were Awasa in the Great Rift Valley, Gewane in the Afar region, and Gondar in the Amhara region of Ethiopia (see annex 7.2 for map). Ethiopian security forces arrested the three fighters while they were travelling through the forest in Gondar on 20 January 2014. 81. When he and his colleagues were captured inside Ethiopia, they were allegedly carrying weapons that were made available to the Monitoring Group for inspection. These included hand grenades, AK-47s, and ammunition (see annex 7.3 for the weapons recovered from the fighters). The Monitoring Group examined the weapons and found that the serial numbers of the grenade pins were in similar sequence to grenade pins that the Monitoring Group had documented in 2011. The grenade pins that were found in 2011 were recovered on ONLF fighters trained and armed in Eritrea. They followed a sequence of “79”, which is the same serial number that was marked on the grenade pins recovered on the Ginbot Sebat fighters during the course of the current mandate. [ii] The consistency in sequencing strongly suggests a single original supplying source for the two sets of grenades, which the Monitoring Group established to be Eritrea in 2011 (see annex 7.4 for photographs of the pins inspected by the Monitoring Group in 2011 and 2014). 82. The two other former Ginbot Sebat fighters were part of another five-person fighter cell recruited in Johannesburg, South Africa, where they were working at the time. The Monitoring Group interviewed them individually on 16 and 17 January 2014. The first identified himself as a founding member of the armed wing of Ginbot Sebat, but he did not have any documentation to show his alleged rank or status within the group. He told the Monitoring Group that in October 2012, while living in South Africa, he had helped to establish the “Popular Front”, which he said was intended for drafting community members in the diaspora into the armed wing of Ginbot Sebat. 83. The second former Ginbot Sebat member told the Monitoring Group that he had been recruited by the Popular Front. His recruiters informed him that he would be sent to Eritrea for military training. 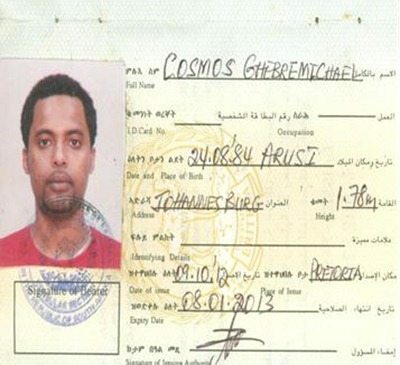 The Embassy of Eritrea in Pretoria issued the new recruit with an Eritrean laissez-passer on 9 October 2012, which he used three days later to travel from Johannesburg to Asmara via Cairo on 19 October 2012 (see annex 7.5 for the travel document and electronic ticket provided to the fighter). 84. When the two newly recruited fighters arrived in Asmara, Ginbot Sebat Secretary-General Andargachew Tsige reportedly met them. [iii] They spent six months awaiting their training, which began in April 2013. The two men told the Monitoring Group that they had joined a group of 30 to 60 Ginbot Sebat fighters at the Harena military camp, where they claimed they had stayed until they fled to Ethiopia in December 2013. They reported seeing other armed Ethiopian opposition groups in Harena, including TPDM, the Amhara People’s Democratic Movement (APDM), and the Oromo Liberation Front (OLF). [iv] The training lasted for a month and it included guerilla warfare tactics and firearms training with hand guns, automatic weapons, explosives and anti-tank weapons. The fighters claim they then spent seven months in Harena waiting to be assigned on mission. 85. The Monitoring Group was unable to independently verify the claims of the former Ginbot Sebat fighters. But based on their corroborating testimonials and the inspection of documents and weapons recovered from them, it appears that Eritrea continues to provide some support to Ginbot Sebat. The Monitoring Group cannot, however, assess the extent of this support as compared with Asmara’s support of Ginbot Sebat in the past. 86. The Monitoring Group shared its findings with the Permanent Representative of Eritrea to the United Nations, Ambassador Tesfay, during a videoconference on 28 July 2014 and requested that Eritrea provide an explanation about the matching grenade pin serial numbers and the travel documents recovered from one of the Ginbot Sebat fighters. Ambassador Tesfay said that either Ethiopia or those captured by Ethiopia must have provided the group with the hand grenade pins and that Eritrea was also in possession of serial numbers of Ethiopian weapons. 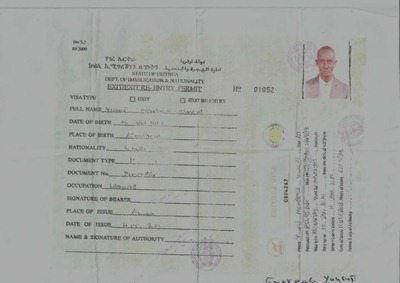 His answer was echoed in the official response of the Government, dated 13 August 2014 (see annex 4), in which it stated: “Travel documents that may have been easily forged by forces who have an interest in framing Eritrea; serial numbers of bullets or weapons that may have exchanged hands between Eritrea and Ethiopia in the course of their multiple wars in the past years … cannot be taken as iron-clad proofs of Eritrea’s misconduct that entail punitive action by the United Nations Security Council.” Moreover, the Government of Eritrea did not provide evidence to support Ambassador Tesfay’s claim that it was in possession of serial numbers of Ethiopian weapons.